Embedded systems are integrated in various diverse functionalities such as ignition, security, and audio systems. Adoption of advanced embedded systems used in automotive industry has increased significantly over past two decades. Among product types, embedded system software segment is expected to increase at a significant CAGR over the forecast period. This is due to deployment of these systems in emerging telematics products and in-vehicle infotainment for automotive. Tire pressure monitoring systems, airbags, anti-lock braking system, satellite radio, telematics, and emission control among others are some of the prominent applications that require the incorporation of an embedded system for their operations. For instance, embedded airbag system is a battery-operated system that works on commands generated from the microcontroller in an event of collision, to trigger the airbag system by operating an alternator. Among vehicle type, electric vehicles segment is expected to exhibit high growth rate over the forecast period. This is attributed to increasing dearth of conventional fuels, in conjunction with factors such as regulations concerning exhaust gas emissions and growing trend of vehicle electrification. For instance the European Union has set its own emissions standards. EU Regulation No 443/2009 sets an average CO2 emissions target for new passenger cars of 130 grams/kilometer. A target of 95 grams/kilometer will apply from 2021. Stringent regulations regarding antilock braking systems (ABS), electronic brake-force distribution (EBD), tire pressure management systems (TPMS), and airbags across the globe to enhance user safety has fuelled deployment of these safety systems in the automotive industry. For instance, in 2008, the U.S. Congress TREAD Act, mandated the deployment of appropriate tire pressure monitoring system (TPMS) technology in all passenger vehicles to improve the driver and passenger safety by means of a dashboard warning system. According to the TREAD Act, as of November 1, 2012 the European Union mandated TPMS in every passenger car models. The US Highway Safety Act of 1991 made airbags and ABS features mandatory in all passenger cars. Embedded technology in these systems is required for efficient operation and this is expected to fuel growth of the automotive embedded systems market. Advent of autonomous vehicle is an opportunity for key players in the global automotive embedded systems market. According to IHS Markit — an automotive database provider — the global autonomous vehicles sales is expected to cross over 600,000 units in 2025 increasing at a CAGR of 43% between 2025 and 2035. Key players in the industry segment include Ford, Mercedes, and Tesla that are involved in the development and manufacturing of autonomous vehicles. According to Markit, autonomous vehicle sale in China is expected to reach around 5.7 million by 2035 and in the U.S. about 4.5 million vehicles. The recent past witnessed key companies in the automotive industry shifting focus towards emerging markets in Asia Pacific. Asia –pacific is the largest growing market in global automotive embedded systems market. China and India are expected to be major growth markets in Asia Pacific. According to The Organisation Internationale des Constructeurs d'Automobiles (OICA), in 2016, total vehicle sales in China was 28,028,175 units, which is 14.5% of the global sales, and this in turn is driving growth of the embedded systems market. Major players operating in the global automotive embedded systems market are Robert Bosch GmbH, Panasonic Corporation, Toshiba, Continental AG, Denso Corporation, Mitsubishi Electric Corporation, Delphi Automotive LLP, Texas Instruments Incorporated, Infineon Technologies AG, Harman International, NXP Semiconductors N.V., and Johnson Electric. An embedded system is a computer system that is embedded into piece of electronic machine to control, access the data in electronics based systems. This embedded system includes a single chip microcontroller such as cortex, Advanced RISC Machines (ARM) and also microprocessors, field-programmable gate array (FPGA), digital signal processor (DSP), and application-specific integrated circuit (ASIC). In automotive application, embedded systems are designed to provide low power consumption, small size, rugged operating ranges, and low per-unit cost. 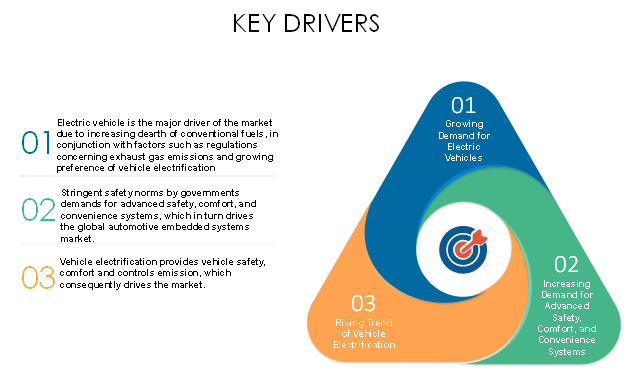 Increasing demand for electric vehicle is one of the major drivers in global automotive embedded systems market. Electric vehicles and hybrid electric vehicles are gradually using embedded systems to enhance efficiency and reduce pollution. According to the International Energy Agency (IEA), the landmark Paris Agreement stated that 600 million electric vehicles would need to be plying on roads worldwide by 2040 to limit global warming to below 2°C (3.6°F). The number of electric vehicle parc was pegged at 2 million in 2016. Globally, plug-in and battery-powered vehicles are expected to increase by 60% in 2017, according to the Global EV Outlook 2017 report from the Paris-based IEA. In the U.S., 160,000 units of EV were sold in 2016, an increase of 37% from the previous year. Key companies covered as a part of this study Robert Bosch GmbH, Panasonic Corporation, Toshiba, Continental AG, Denso Corporation, Mitsubishi Electric Corporation, Delphi Automotive LLP, Texas Instruments Incorporated, Infineon Technologies AG, Harman International, NXP Semiconductors N.V. and Johnson Electric. *Browse all the market data tables and figures on "Automotive Embedded Systems Market - Global forecast to 2025”.